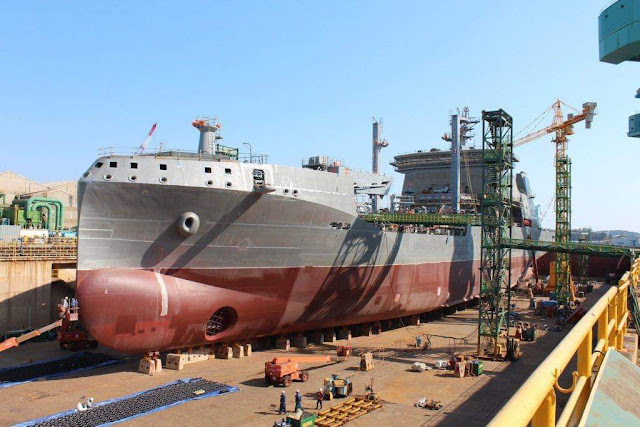 The HMNZS Aotearoa while under construction in HHI's yard in South Korea. Photo c/o RNZN. The HMNZS Aotearoa (A11), a replenishment tanker being constructed by South Korean shipbuilder Hyundai Heavy Industries for the Royal New Zealand Navy (RNZN) under a US$493 million contract, is nearing its launching date, which is expected to happen within April 2019. The ship is considered as the largest ship ever constructed for the RNZN, and will provide logistics support to New Zealand and coalition maritime, land, and air units. It is expected that the ship will be commissioned with the RNZN by early 2020. The ship is capable of providing fuel resupply to ships, as well as supplying dry goods, water, ammunition, and spare parts. The HMNZS Aotearoa has a crew of 64, features a wave-piercing hull, and will be 173.2 meters long and displaces at 26,000 tons. It is capable of operations in the Antarctic with ice-strengthened hull and considerations of winter operations. It can carry twelve 20-foot shipping containers, aviation and marine fuel tanks, a dual all-electric replenishment at sea rigs, and high capacity freshwater generation plants. It will have facilities to carry helicopters of the New Zealand Defence Force (NZDF) including the Kaman SH-2 Seasprite naval helicopter and the NH Industries NH90 medium helicopter.